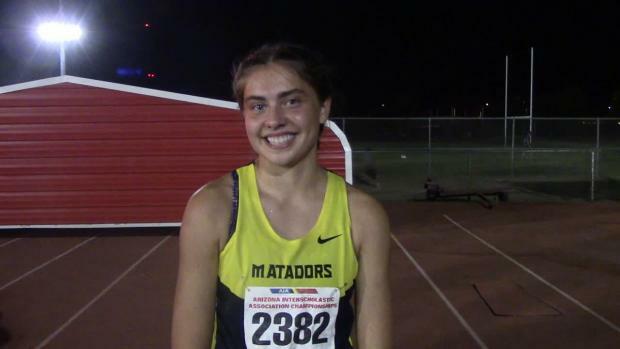 After dealing with an injury as a junior, Meagan Van Pelt set her sights on ending her career with a State Title. 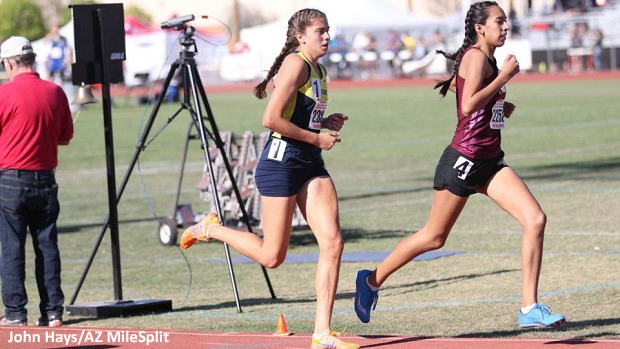 At Brophy AMDG, she ran 5:14.54 in the 1600m for her second race of the season. 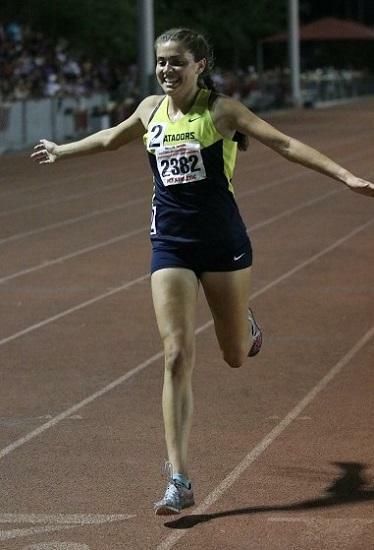 She ended the regular season with medals in all three of the distance events at the State Championships including a State Title in the D3 Girls' 3200m. Earlier this month, Meagan raced the mile at the Portland Track Festival and placed 6th with a lifetime best of 5:07.62. 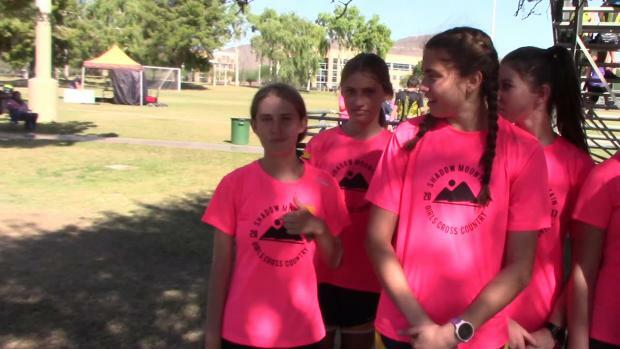 I am from North Phoenix and began running in elementary school with the runners' club that met twice a week before school. I didn't start competitively running and racing until 8th grade. 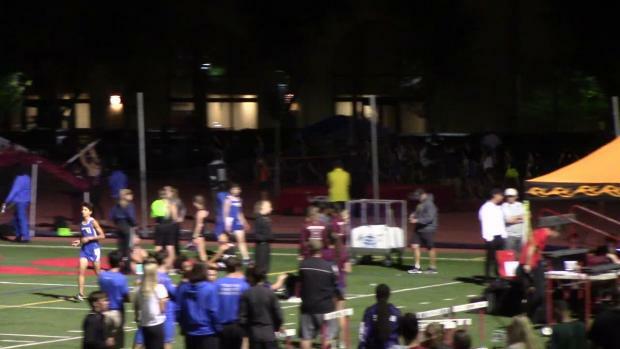 My most memorable race was at the Portland Track Festival this summer. I was able to travel with a couple of friends from a neighboring school and we entered into the mile race. It was so much fun racing in the rain, coming away with a PR and winning my heat. But the best part was being able to cool down with Matthew Centrowitz. He's a laid back and funny guy. Did you listen to music before competing? If so what's on your playlist? I don't listen to music personally but at my team camp there is always a speaker on blasting the top songs or even sometimes my teammates' songs off SoundCloud. My coaches especially love the Migos. My greatest accomplishment has been winning the 3200m race at state this year. All I've wanted since my freshman year was to win an individual state title and what better way to end your last state meet than accomplishing a goal of yours. One of my most difficult obstacles I had to overcome was an injury I had my junior track season. It was not fun having to cross train for 2 hours every day and not being able to practice with your teammates. But I had the best support system that guided me to have the best season possible given my circumstances. What will you miss the most about competing for your team? I will miss my teammates and coaches. We always knew how to have a good time at every meet. We even went to prom after the Saturday state meet and took photos with the boys' team trophy in the photo booth. They are like my second family and it will be hard not seeing them every day. I would tell younger athletes to value recovery above anything else. From refueling after running to getting a good night's sleep. They are key parts of the process. What influence have your coaches had with respect to your performance and overall life goals? My coaches have influenced me as a runner to be a competitor in every race, no matter the weather conditions, people in my race or what race it is. As long as I show up and compete it will be a good day. And even when things don't go my way there is something to be learned and improved upon. After all it's just a race. What are your college plans? Have you decided on a major? I plan on attending and competing for NAU. I'm interested in exercise science and possibly continuing my education to become a physical therapist. What made you feel most comfortable about choosing Northern Arizona? My friends and family know how much I like the outdoors and exploring so when I chose NAU it wasn't much of a surprise. Also, my mom went to NAU and my twin will be attending with me. And the running community in Flagstaff is unrivaled with anywhere else in the world. Who would you like to thank for your success in high school? I would like to thank my coaches, parents and teammates for supporting me in all my endeavors. Without them none of this would be possible and I cannot imagine my journey without them. Ice baths never get better. My favorite vacation spot has to be Portland or Seattle. I love the Pacific Northwest with all its rain and dense forests. What's your preferred pre-race meal? It depends on what time of day my race is but I usually eat a bagel with peanut butter and a banana. Then I usually snack on dense foods like Picky bars to keep me satisfied throughout the day. What's your go-to training shoe? I really like Brooks' shoes and my favorite so far has to be the Glycerin. You've done a cool down with Matt Centrowitz already. Is there another professional athlete you'd like to accompany on a long run, if given the chance? If I could run with another professional athlete it would have to be the Bowerman Babes, I don't think I could choose just one. What are you most excited to do when you move to Flagstaff? I am most excited about the change of weather. I've always wanted to try skiing or snowboarding so hopefully there is enough snow this winter to do that.